Indigenous people want their leaders held accountable, but journalists should be cautious about perpetuating negative stereotypes, Ryerson School of Journalism Rogers Visiting Journalist Duncan McCue said during a lecture on Indigenous politics. By way of example, McCue said stories such as those of the “crooked” and “corrupt” chiefs that make massive salaries and go on vacations should be reported by journalists. But they need to be put into perspective – a vast majority of chiefs do not make that much and have average salaries, he said. Some of them make less than municipal councillors even though they have the same or more responsibilities, including municipal infrastructure and treaties, he explained. “Not all First Nations in this country are operating in these corrupt manners,” said McCue, who is a member of the Chippewas of Georgina Island First Nation in southern Ontario. “There are some though…and they absolutely should be reported from my perspective because First Nations citizens want to see them reported,” McCue told the crowd of mostly journalism students attending the discussion organized by the Ryerson Journalism Research Centre. “First Nations citizens aren’t happy when they find out that their chief has been collecting a $400,000 or $500,000 salary every year. They want to know that kind of thing and…the way that the Indian Act has been set up, they don’t always know. Band councils are not always sharing and transparent [with] the kinds of documents that First Nations band members want,” he said. 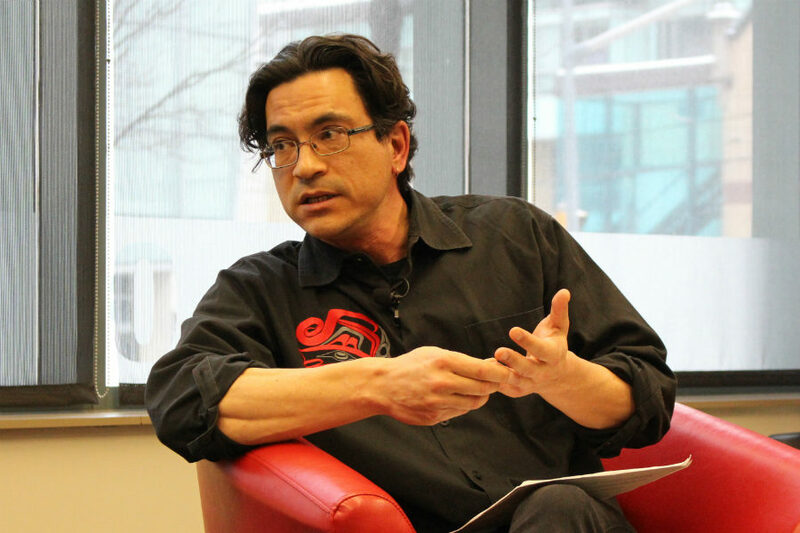 McCue is Anishinaabe and an adjunct professor at the University of British Columbia. The host of CBC Radio One’s Cross Country Checkup, he has been a reporter for CBC’s The National and was part of an award-winning CBC Aboriginal investigation into missing and murdered Indigenous women. At the start of his presentation, McCue said he was deliberately using “archaic” terms, like “Indian” and “band council” when analyzing and explaining Indigenous history and talking about politics because the terms are from the Indian Act, which “is the system that still governs the majority of First Nations in this country.” When reporting on Indigenous communities, he added, journalists should ask the people they interview which terms they prefer and use those in their stories. He said effective reporting on Indigenous politics also requires an understanding of who wields power at the community level. Many of the 600 First Nations groups in Canada have hereditary chiefs who wield influence, McCue said, but the Indian Act also requires that band members vote by secret ballot for chief and council members. The more members you have in a band, he added, the more councillors you have. Other communities, he added, have negotiated treaties with the federal government and therefore operate with their own election codes outside of the Indian Act. Bands typically have an election every four years, he said, and many newsrooms have not shown an interest in covering these events. Although most First Nations may have an “open-door policy” when it comes to giving journalists access to Indigenous affairs such as band council meetings, there are no clear rules governing media access under the Indian Act, McCue said. This same conclusion was reached by Discourse Media recently, which recently published a five-part investigation that examined press freedom issues and access to information in First Nations communities, including the legislatures of self-governing First Nations established by modern-day treaties. “It really is a gray area that’s been untested legally about whether freedom of the press actually exists on Indian reserves,” McCue said. Whether you can cover an election, he said, depends on the chief and council. “There are laws in the Indian Act about trespassing on an Indian reserves, and anybody who is not a band member can be asked to leave,” he said, noting that refusing to leave can result in trespassing charges. Being sent away, he said, may the result of the difficult relationship journalists have had with First Nations in the past. But it can also arise in other situations: McCue, for instance, said he was asked to leave a reserve while he was writing a story about an allegedly corrupt chief and council. Understanding the rules regarding access, however, helped McCue find a workaround: If journalists are invited onto a reserve by a band member, he said, they are allowed to be there with the member. McCue also urged journalists to build relationships with Indigenous communities by covering the good news as well as the bad news.